... Die Geschichte dieser Musik ist zum großen Teil noch unbekannt. Rom 2012. Im Februar während eines kurzen Aufenthalts, über die Plätze der Stadt wehend, schon angenehm warm, entfernt den Szenarien im Norden, irgendwie angekommen in einer vorläufigen Brutstätte des Seins, dort wo Passolini seine Menetekel in den Äther schrieb. Die Cafes in denen dieser gerann konnten ihre Ruhe nur knapp verbergen und jene Orte an denen Erinnerung zelebriert wird sind so alt, dass jüngstes Vergessen kaum auffällt. Geschichte verschwindet gerade um die Ecke. The story behind this music is for the most part unknown. Rome 2012. During a brief stay in February - wandering from place to place in the city, pleasantly warm, every day life in the North now vanishing, somehow a newcomer in this interim spawning ground of being, here where Passolini hinted his portent in the ether. The cafes in which the ether coagulates, barely concealing their peace and tranquility, and each place where memories are celebrated are so old that forgetting now is hardly noticeable. History disappears just around the corner. One who fights "against" this forgetfulness , is an atypical Roman, Massimo, whom I met in front of the now entirely contrived Fiaschetteria, once the hangout and meeting place of Roman artists, who gave me an update of the happenings in the Italian scene. Later in the train while the sounds of AH23 fluttered gently through my mind (I imagined his burning finger and M.’s portrait sunk into the Tiber), a video popped up, totally unexpected, on my google site. John Cage and Cathy Berberian, who performed this mysterious aria in Rome, sang a piece whose link I was able to pull up on my computer - something about "yellow" and "wood" that I later discovered was "Yellerwood." A voice from the Roman Hills sounded so like Berberian. Then the request on this unknown woman, via Mr. Ricci, if she might be interested in contributing her wonderful voice to recordings done in October 2011 with Udo, a bustling multi-reed man. Something however was missing. This project originates from a pleasurable Roman afternoon spent by yours truly with Hubert Bergmann, who – having known that this writer’s spouse is, in essence, an atypical songwriting specimen – thought that some experimentation using her vocalism would have constituted an intriguing attempt to do something singular. Files of Bergmann’s duets with Udo Schindler were emailed, and in a matter of several months Yellerwood recorded and “assembled” a number of parts, adapting them to three of the thirteen chapters. 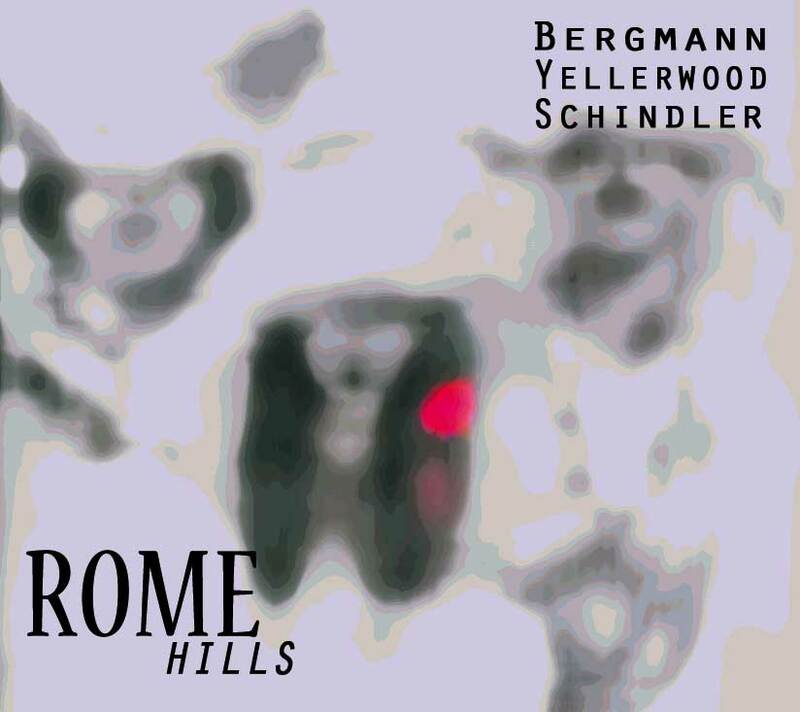 The result is Rome Hills, a set of on-the-edge yet totally comprehensible acoustic pictures that manage to sound deluxe and/or crazy depending on the moment. The technical endowments involved are conspicuous, making for gratifying listening even by just considering the merely aesthetic values. But there are unquestionable depths to be probed all over the program. Bergmann and Schindler enrich their dialogue with fluent savoir-faire in “Blinksquint”, a track that sounds bluesier than the actual blues present in the disc (“Final Palestine Blues”, which sees the cornet as a somewhat drunken protagonist). “Dim Minuendoyalp” juxtaposes warrior-like discordant propulsion with aleatory trajectories replete with primeval cries and cultivated sentences. “Piazzazappa” doesn’t recall anything near the namesake Frank as far as I can hear, showing that high speed and clever finickiness can coexist; a coherent obstinacy imbued with a modicum of semi-sociability. “Candle Fright” is out-and-out glorious, Bergmann’s reserved chords creating the grounds for Schindler’s clarinet to wail quietly, surgical precision defining this great execution. The pianist also dedicates a series of Cecil Taylor-esque flurries to Alfred 23 Harth in “Hearth To Play”. Yellerwood – who idolizes Meredith Monk, feels a spiritual kinship with Amanda Parsons (of Northettes renown) and goes to sleep with Laura Nyro in the iPod – lends gleaming sinewy pitches to a Bergmann poem in “There Is No Panic Room Where Light And Shadows Could”, jumping ranges with flexible authoritativeness to situate the piece inside early 20th century territories. “Smellägood” – a restfully eerie, quasi-lowercase episode – finds her testing the comrades’ silent wisdom via sharp lilliputian vocalizations mutating into elliptical clusters. In the album’s finale “Cathy’s Bardobath Aria” (note: the girl had never heard Mrs. Berberian’s work before, believe it or not) an underworld of sarcastic elves pushes a growingly complicated entanglement of screechy reeds, immoderate pianism and extremist tittle-tattle to ultimate choral pandemonium, an impertinent tuneful signature utilized as wrap-up amidst the stunned “oohs” of those curious creatures. There seems to be no genre restriction to respect when open-minded artists decide to produce stimuli for everybody’s ears, and they really mean it.